The Euro – Sickness unto Death? Also the law for the growth of this continuity differs from that of a debt or a negation. A debt does not grow by not being paid back, it grows every time it is increased. But sin grows every moment one fails to get out of it. Far from being correct in thinking that only new sin increases the sin, it is his being in a state of sin that, in Christian terms, puts the sinner in the greater sin, it is the new sin. We even have a proverb which says that to err is human while to remain in error is of the devil. Let me repeat what I think involves a little lesson: “A debt does not grow by not being paid back, it grows every time it is increased“. Thinking of European (Greek, Portuguese, Irish, …) debt this is certainly true. As long as you pay the interest on your debt, your debt does not grow. Now for the interesting part: “But sin grows every moment one fails to get out of it“. 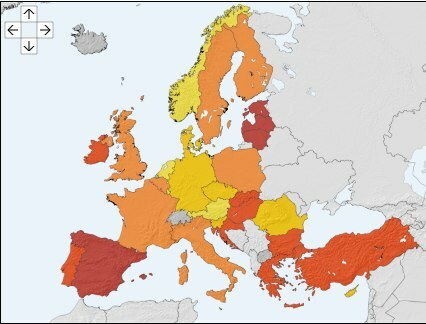 Now think of unemployment in the European net debtor countries (the PIIGS). Every moment that unemployment stays at levels which are equal to a sin, the problem gets worse. By this I want to say that stabilizing unemployment at double-digit levels cannot be the solution to the problem of unemployment. Persistent high unemployment will create social problems. Young people are especially hard hit by unemployment, and they will lose their lifetime perspective if this goes on for too long. Monetary policy is not the only issue where expectations matter – unemployed people look at the macroeconomic situation and then decide how to deal with it. The map shows Eurostat data on unemployment in Europe. Light yellow indicates a rate of 0-5, dark yellow 5-7.5, light orange 7.5-10, dark orange 10-15 and red above 15 percent of unemployment. From this perspective, the European unemployment problem needs to be attacked. It is not enough to stabilize unemployment at high levels, since the “original sin” will be a major burden in the future as human capital is wasted and social systems fall apart. In Spain, the most-viewed article of today’s EL PAIS comments on a TV program on the Civil War which puts the blame on the (left-wing) people behind a political murder of a right-wing politician. This, the article assures, is not what history books tell us.In other news, Javier Cercas’ recent novel Memoria de un instante redraws the (right-wing) coup d’etat of 1981. While Spain should certainly confront its ghosts of the past, this might not be the perfect moment.